The affordable Firebird Quad Torch lighter bearing the legendary Colibri name, boasts four wind resistant torch flames that will fire up a premium cigar in a jiffy with precision accuracy. The large Red transparent fuel tank window in this model takes all of the guesswork out of refilling so you will never be left with an unlit stogie in hand. Also on board is a dual action ignition and an over-sized flame adjuster wheel for hassle-free ease of use. 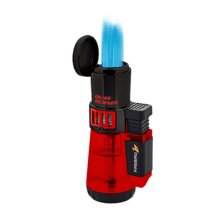 With Firebird you get many of the features found on more costly lighters. Your bid for boxes of Firebird Quad Torch Red Tank at $ per box is confirmed and will be added to your cart if your bid is successful.